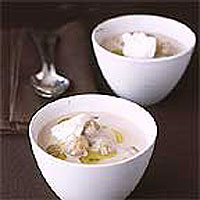 A modern version of a traditional soup prepared in the farmhouses of Upper Provence. The classic combination of Ricotta with sweet chestnuts and fennel is smoothed and softened by the addition of cream. For a richer broth, you can, if you wish, replace the water with chicken stock. However, the water-based version allows a better appreciation of the delicate flavour of the chestnuts. Put the chestnuts in a roomy pan with 500ml water. Add the diced fennel, the bay leaf, allspice and 1 tsp salt. Bring to the boil, turn down the heat and simmer for 30-35 minutes, or until the fennel is perfectly soft. Liquidise or mash half the soup with the cream and a grinding of pepper. Return it to the pan, with the unliquidised soup, and gently bring back to just below the boil. Remove the bay leaf. Ladle into soup bowls, drop in a spoonful of Ricotta and finish with a drizzle of olive oil.